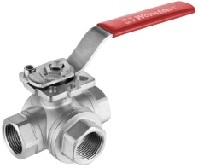 A stainless steel 3 way ball valve with higher platform mounting pad, 1000 WOG. Design features: L port or T port 3 way type, reduced bore; threaded ends(NPT/BSP/BSPT), optional BW or SW; higher-platform ISO 5211 mounting pad, lever operated, 1000 WOG. The G.A drawing illustration of stainless steel 3 way ball valve with higher platform mounting pad, 1000 WOG. The material selection for stainless steel 3 way ball valve with higher platform mounting pad, 1000 WOG. Other material are available upon request. 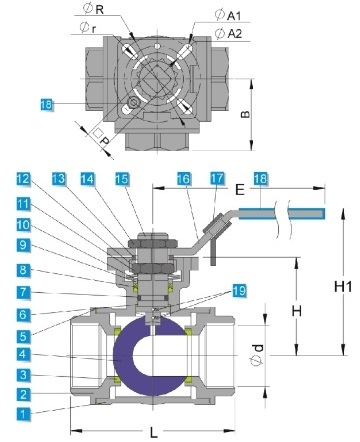 Dimensions of 3 way ball valve with higher platform ISO 5211 mounting pad, 1000 WOG. All dimensions are in mm unit.